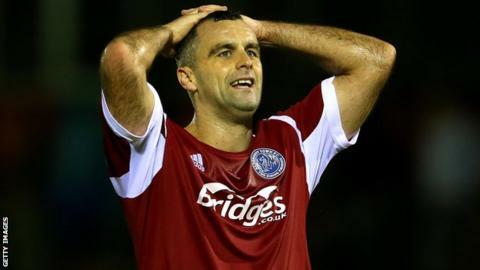 An own goal from Aldershot caretaker player-manager Chris Barker gifted Altrincham their fourth straight win. It was the 34-year-old's first game in temporary charge of the Shots following January's sacking of Andy Scott. Barker deflected in James Lawrie's effort from a wide angle as Altrincham finally broke the deadlock in a game they had dominated. The result leaves Altrincham safe in mid-table, while five defeats in a row leave Aldershot close to the drop zone. "It wasn't brilliant but we came here as an organisation and we've done the shape for the last four or five days and this is what we've all worked on. "We have to stay together and we now have three home games out of four so hopefully the fans will get behind us and hopefully we'll climb the table. "I thought the three boys who came played well, I crossed the ball to Josh (Scott) and if that goes in 1-1, everybody is happy but we have to carry on and the results has gone against us today. We go again Monday." Match ends, Altrincham 1, Aldershot Town 0. Second Half ends, Altrincham 1, Aldershot Town 0. Matthew Saunders (Aldershot Town) wins a free kick. Hand ball by Steven Gillespie (Altrincham). Attempt missed. Nicky Clee (Altrincham) header from the centre of the box. Foul by Ryan Jarvis (Aldershot Town). Substitution, Aldershot Town. Josh Scott replaces Jim Stevenson. Attempt missed. Damian Reeves (Altrincham) left footed shot from outside the box. Goal! Altrincham 1, Aldershot Town 0. James Lawrie (Altrincham) right footed shot from a difficult angle on the right to the top right corner. Attempt saved. Kyle Perry (Altrincham) header from the centre of the box is saved. Assisted by Simon Richman. Substitution, Altrincham. James Lawrie replaces Sean Williams.